An interesting article was published today discussing the entire "quick and easy meals" trend that has personally made a huge impact on my life (meaning I actually cook now). 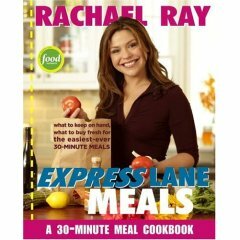 Rachael Ray and the Express Lane Meals concept are featured as a way to tackle the problem of getting a healthy meal on the table quickly. Also featured giving helpful hints and tips are Renee Schettler, food editor of Real Simple magazine, who has written "Real Simple Meals Made Easy," Susan Puckett, co-author of "The 5:30 Challenge: 5 Ingredients, 30 Minutes, Dinner on the Table" and food editor of the Atlanta Journal-Constitution, and Lynn Vettle, a senior test-kitchen manager for Pillsbury, which publishes "Pillsbury Fix It Fast: Dinner Ready in 25 Minutes or Less." I have yet to really branch out from Rachael Ray recipes. Why mess with perfection? But if I were to take a risk and branch out, I would probably start with one of these authors. I have the 5:30 Challenge and I love it!